5 Dead In Shooting At Burlington, Washington Mall; Suspect Remains At Large : The Two-Way A shooter opened fire inside a Macy's at a shopping mall in Burlington, Washington on Friday evening. The suspect remains at large and the motive is not clear. 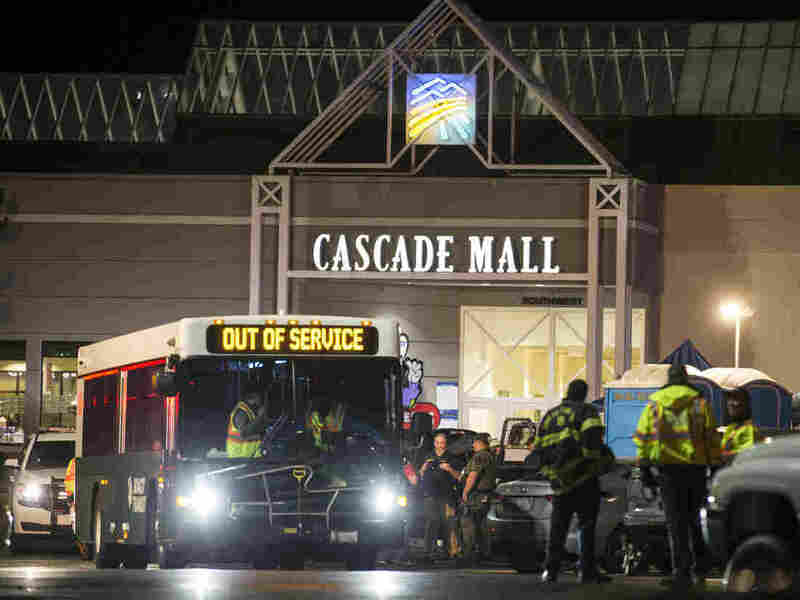 Emergency personnel stand in front of an entrance to the Cascade Mall at the scene of a shooting where five people were killed on Friday in Burlington, Wash.
Police say 5 people were killed after a shooter opened fire inside a Macy's at a shopping mall in Burlington, Washington on Friday evening. Police spokesman Sgt. Mark Francis told reporters that the man was armed with a "long gun, a rifle-type gun." He initially said the suspect is a Hispanic male in his 20s or 30s. At a press conference on Saturday, however, authorities said they were not certain of the suspect's race. "He was wearing all black ... and he had kind of a close haircut, his hair was kind of scruffy," Francis said. He released a photo of the suspected shooter on Twitter. "We believe at this point one lone shooter," Francis said. "This investigation will be ongoing, and whether or not someone helped him out in some way is yet to be determined." The FBI said on Twitter that it is assisting with intelligence review and manpower and adds that it "has no information to suggest additional attacks planned in WA state." FBI Assistant Special Agent in Charge Michael Knutson said at a press conference that they have "no indication that there was a terrorism act at this point in time." Police Lt. Chris Cammock said the suspect walked into the mall without a weapon — and "about 10 minutes later, entered Macy's with a rifle." Authorities had initially reported four female victims who died at the scene. A 5th victim, who is male, later died in the hospital, as Francis tweeted. The victims' identities have not been released. "This was a senseless act. It was the world knocking on our doorstep, and it came to our little community here," Burlington Mayor Steve Sexton told reporters. "Our community comes together in times of tragedy, and we're going to do it again." This is the second violent incident at a U.S. mall in less than a week. Last Saturday evening, an assailant at a mall in St. Cloud, Minn. stabbed nine people before he was shot dead by an off-duty police officer.